Truly a "Jacqueline of all Trades," Rachel Ellyn proves to be very difficult to define in a neat sentence, however her writing very easily converts readers to "fan" status. With degrees in both Finance and Economics, Rachel found wonderful success in the business world. But her keen curiosity and interest in others, coupled with the need for self-awareness, took her down the proverbial "road less traveled," and Rachel shunned the "power suit and high heels" for comfortable jeans. (Truth be told, the high heels have stuck around, and are frankly a bit of a weakness.) Now, combining her passion for writing and story-telling with the skills, knowledge, and drive that led to her business success, Rachel shares her offbeat take on the world through prose. Born in Kingston, NY, raised in McLean, VA, and having lived around the D.C. Metro Area, London, England, St. Louis, MO, Madison, WI, and Sacramento, CA, Rachel soon realized that the world was as small as it was big. Rachel listens intently to people she meets on the street during the course of everyday life, loved ones who surround her, and to the beat of her own heart to generate ideas for her work. The results are a publicist's nightmare; writing in multiple genres including children's fiction, flash fiction, romance, and suspense/thriller. Life, love, divorce, traveling pigs, and children are only the tip of the proverbial iceberg with regards to the subject matter Rachel tackles with gusto. 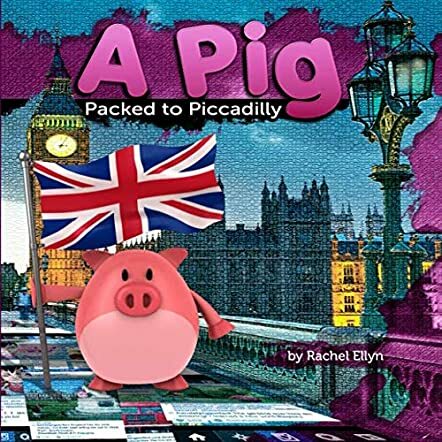 Meet Hamlet, Vivienne Scarlett, and Edith in A Pig Packed to Piccadilly by Rachel Ellyn. Hamlet, the pink pig with a pin-curl tail, and Vivienne Scarlett have had many adventures together and they were good friends. But they had a fight last week and Vivienne said some hateful things to Hamlet. There was a box on the kitchen counter which was ready to be sealed and sent to Aunt Eleanor in London. Hamlet thought in his anger that if Vivienne did not love him, he would explore the world. He climbed into the box and Aunt Eleanor was surprised to see Hamlet when she opened the box. She puts Hamlet together with Edith and as they go sightseeing in London, Hamlet understands the true meaning of friendship, good manners, and sharing. The story has some good messages for young readers and the author deftly weaves these into the plot with the help of Hamlet, Vivienne Scarlett, and Edith. The illustrations are charming and adorable and they make the story appealing and captivating. Hamlet's adventures in London are fun and interesting and they will encourage readers to travel to new places and explore. It is a good bedtime storybook and can be used in classrooms and school libraries for read aloud and storytelling sessions because of the messages and concept. The presentation of the photos is unique and different, and the idea of presenting them like that - of being uploaded on to a social networking site - makes it original and entertaining.